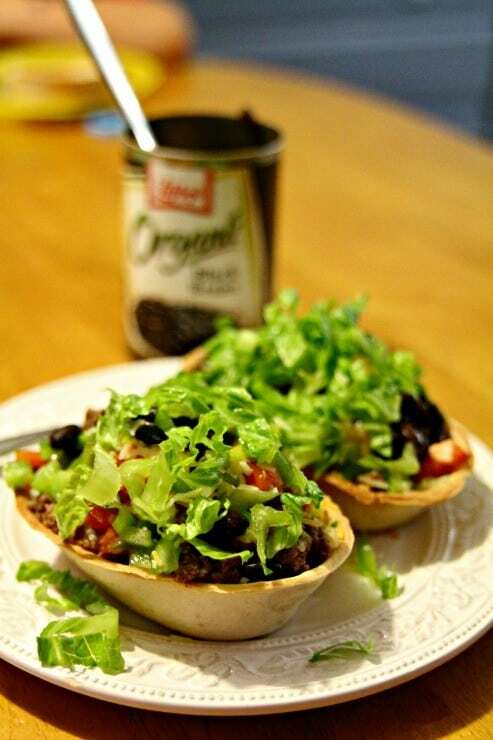 This black bean taco bowls recipe post is part of a partnership I have with Libby’s and their PR firm. Opinions are my own. One of my LEAST favorite things to do is come up with meal ideas. Give me guidance and I’ll happily prepare just about anything. But leave me to figure out the ingredients and stuff? Not always my forte. I like cooking, especially when the kids are able to help. I just need help with the WHAT to cook sometimes! Last week, Libby’s foods sent me a box of their products. In that box was a few cans of their Organic Black Beans. I saw them and thought, I should totally make a black bean chili. So naturally, when I actually went to make dinner, it only makes sense that I decided instead to make a Chipotle-inspired Black Bean Taco Bowl recipe instead. Right? I loved my “bowl” at Chipotle and the black beans just seemed to fit. Today was gymnastics and then tap class and it meant we’d not be home before 5:45. Too late to start dinner when I had a Girl Scout leader meeting at 7, that’s for sure! So, I prepped almost everything while I made lunch and talked with my little one about her day, and she helped me put the chopped veggies on a plate and cover dishes for the fridge. Return to pan and add taco seasoning. This recipe is EASILY done ahead of time. I browned, drained and seasoned the beef as I made lunch, as well as made the rice during that time. I chopped all of the veggies up and left them on a plate in the fridge. When we got home, I quickly assembled the bowls and popped them into a 350 oven for 5 minutes to get warm. Each day during the week of September 16-20, five bloggers (including me) will be partnering with @LibbysTable to host mini-Twitter parties dedicated to discussing and solving dinner dilemmas. -Monday through Friday, each day will focus on a different theme – from how to cook for kids, to how to plan ahead or how to organize the most efficient and convenient pantry. -Each party will allow participants the opportunity to win a #DinnerDilemma themed prize pack! -Follow @LibbysTable on Twitter to learn more! One reader will win a Libby’s prize pack including a 17 piece Magic Bullet set and assorted Libby’s products! When I’m on my own and don’t have to cook for anyone but me, my go-to dinner is scrambled eggs and toast. No fuss, no muss, just a quick and tasty meal. When I get a good buy on ground turkey, chili is my go-to dinner. I like bell peppers in my chili but fresh peppers are usually quite costly, so I pick up a bag of chopped frozen peppers (if they’re product of USA or Canada–I won’t buy Mexican produce). I find them to be just fine in this sort of recipe. Burritos are a go-to dinner we have fairly often. I use ground beef or turkey, depending on what’s on sale, and I like to add onions and cheese. Some canned refried beans, heated in the microwave or on the stovetop, make a nice side dish. I’ll be making another go-to dinner for tonight: Meatballs with spaghetti and tomato sauce. I’ll make a large batch of meatballs this afternoon, then freeze some for a quick meal later on when I don’t have time to make them from scratch. Thanks! I either thaw the meatballs in the refrigerator during the day, or in a bowl of cold water (still in the freezer container) an hour or so before starting dinner. I sometimes put the frozen meatballs directly into the saucepan with the tomato sauce and let them heat up that way, but it takes longer. One of the things I try to stock in my freezer is a bag of spinach ravioli. When I’m up against the wall, it’s a cinch to make that for dinner, with tomato sauce or a quick sage-butter sauce. I make chicken a lot, so I often have leftover chicken. One of my go-to meals using the meat is chicken in cream sauce over rice. I love it with onions and mushrooms, or broccoli. It’s a family favorite, no matter what “extras” it has. Breakfast for dinner is an easy way to solve a dinner dilemma. French toast is one of my favorites. Well, I had a dinner dilemma last night! I was cooking dinner in the microwave, multiple dishes in multiple stages, when the microwave just up and died. I was able to regroup and finish cooking the meal in the toaster oven, but we ate dinner an hour later than I had planned. Going microwave shopping today–we use it all the time, so it’s kind of a necessity. Quiche is a go-to meal for me. I usually make my own pastry but sometimes fall back on the refrigerated store-bought kind. Cheese and eggs are always in the refrigerator, and I vary the quiche by using leftover meat and/or veggies. A side salad rounds out the meal. My go to meal is hamburgers and hot dogs. I make a lot of spagetti too. Pizza is another go-to meal at our house. I make the dough in my bread machine. We all love the pizza, and it’s pretty simple for me to make. A quick pantry meal is spaghetti with sauce. Not very exciting or creative, but there’s always a jar of sauce and a box of pasta on the shelf. Go to recipe is definitely spaghetti with meat sauce. Having prepared food in the freezer is a great help when facing a dinner dilemma. For example, when I make chili, I make a big batch and then freeze it in dinner-size containers. Then all I need to do is make a quick side dish like cornbread when the chili is defrosting and heating in the microwave. If I’m having a dinner dilemma, I fall back on cheese quesadillas or grilled cheese sandwiches, depending on whether or not I have any tortillas. A salad and fries or chips on the side, and it’s okay. Another go-to meal at our house is a one-pot turkey kielbasa with vegetables and rice, which I cook right in the rice cooker. Easy peasy. I had a dinner dilemma earlier this week when I pulled all the meat off a cooked chicken then stepped out of the kitchen for a few minutes. When I came back, the chicken was gone and the dog was licking his chops. Bad dog! We had salad and grilled cheese sandwiches that night instead of the lovely chicken in cream sauce over rice I had planned. I’m still not on speaking terms with the dog. My go-to meal is mac & cheese. Everybody loves it, and I always have the ingredients on hand.